In less than two weeks lovers everywhere will come together to express their devotion. Whether it be with flowers, candy or a nice dinner; February 14th is the day people go all out to celebrate their love for each other. Who else is involved in this dinner? What is this Taste from N8tion.com? "Taste is a new mixology show that features cool cocktails from the common guy. From the creative minds at N8tion.com, our resident “booze head” Otis showcases classic and not-so-classic cocktail recipes. Who is Otis???? We found him under a bar in downtown Atlanta nursing a Corona while holding a box of Krispy Kreme doughnuts. No seriously, after tending bars for countless college parties, he honed his bartending skills in local taverns on the nights he wasn’t moonlighting as a bouncer. Taste is a product of N8tion.com, an independent television and radio network founded by brothers Myron and Otis McDaniel." When I think Valentine's I automatically think chocolate; so I knew my dessert would some how involve chocolate. I started out making a sponge cake and it just evolved from there. Drenched in Ameretto filled with whipped mascarpone cheese and covered in deep dark chocolate; sounds like true love to me. Heat milk and butter till butter melts, keep warm. Sift flour with baking powder 2x, set aside. Whisk sugar and eggs together over water bath until warm. Transfer to a mixer and beat on high speed till cooled, tripled in volume and thick. Sift in 1/3 of the flour mixture and fold gently...continue this process until all flour has been folded in. Fold in hot milk mixture scraping the bottom well. Pour into a greased and floured 1/2 sheet jelly roll pan. Bake about 18 minutes on @350 until cake browns and starts to sink. Put the chocolate and cream in a small bowl and melt the chocolate over a saucepan of gently simmering water. Let the chocolate mixture cool to room temperature, then stir it and the vanilla into the butter mixture. set aside. Combine the warm water and the sugar in a shallow bowl and stir until sugar dissolves. Stir in the Amaretto. Cut sponge cake into even size layers. Brush each layer with the Amaretto soak. 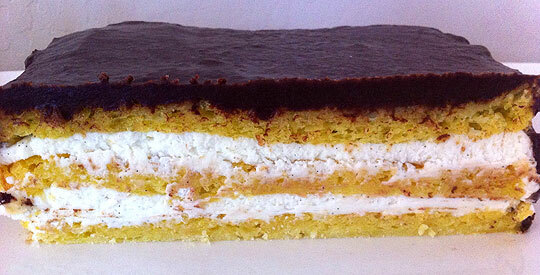 Top the sponge cake with 1/2 of the whipped mascarpone. Repeat with the next layer. Top entire cake with chocolate and spread. Oh my goodness Theresa, this looks and sounds so yummy! I have this Italian Rum Cake recipe that has been in the family for years that Ive been putting off baking because it takes so long to prepare.. I might just opt for this instead! I want to eat everything on our V-Day menu this week. this meal really flows well together, I think, with the flavors etc. And this cake looks like a killer-- count me in! Looks sinful - perfect for Valentine's Day! Your recipe sounds so yummy...can't wait to try! This is right up my alley! The picture is making me drool as well! If you put chocolate, amaretto and mascarpone into a cake, I cannot resist. Bookmarked! Chocolate. And mascarpone. Now THIS is heavenly.